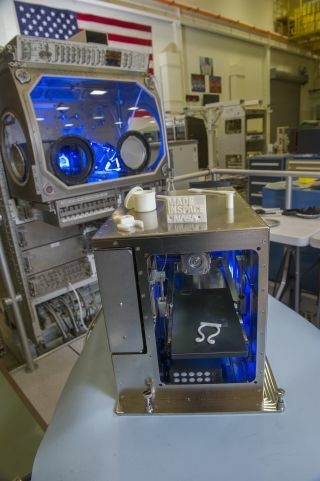 In April, this 3-D printer passed tests at NASA's Marshall Space Flight Center in Huntsville, Alabama. The first 3D printer ever to fly in space will blast off this month, and NASA has high hopes for the innovative device's test runs on the International Space Station. The 3D printer, which is scheduled to launch toward the orbiting lab Sept. 19 aboard SpaceX's unmanned Dragon cargo capsule, could help lay the foundation for broader in-space manufacturing capabilities, NASA officials said. The end result could be far less reliance on resupply from Earth, leading to cheaper and more efficient missions to faraway destinations such as Mars. 3D Printing in Zero-G is a collaboration between NASA and California-based startup Made in Space, which built the machine that's heading to the space station this month. The microwave-size 3D printer was cleared for flight in April after an extensive series of tests at Marshall. 3D printers build objects layer by layer out of metal, plastic, composites and other materials, using a technique called extrusion additive manufacturing. NASA hopes Made in Space's device works normally aboard the station, thus demonstrating that 3D printers can produce high-quality parts in space as well as on Earth. If that turns out to be the case, replacing a broken part or tool aboard the orbiting lab could be a matter of simply pushing a button. "I remember when the tip broke off a tool during a mission," said NASA astronaut T.J. Creamer, who lived aboard the space station from December 2009 to June 2010. "I had to wait for the next shuttle to come up to bring me a new one. Now, rather than wait for a resupply ship to bring me a new tool, in the future, I could just print it." It will likely take the 3D printer from 15 minutes to an hour to print something aboard the space station, depending on the size and complexity of the object, researchers said. Blueprints for desired parts can be loaded onto the machine before launch or beamed up from the ground. Mike Snyder and Jason Dunn of Made In Space construct a 3-D printer in the company's cleanroom. This device will eventually be utilized on the International Space Station. "This means that we could go from having a part designed on the ground to printed in orbit within an hour or two from start to finish," Werkheiser said. While the space station is the proving ground for this test, NASA officials see great potential for 3D printing beyond low-Earth orbit. For example, deep-space missions could benefit greatly from the technology, because it would be tough to ferry a spare part to a vessel already on its way to an asteroid or Mars. "NASA is great at planning for component failures and contingencies. However, there's always the potential for unknown scenarios that you couldn't possibly think of ahead of time," said Ken Cooper, principal investigator at Marshall for 3D printing. "That's where a 3D printer in space can pay off. While the first experiment is designed to test the 3D printing process in microgravity, it is the first step in sustaining longer missions beyond low-Earth orbit."